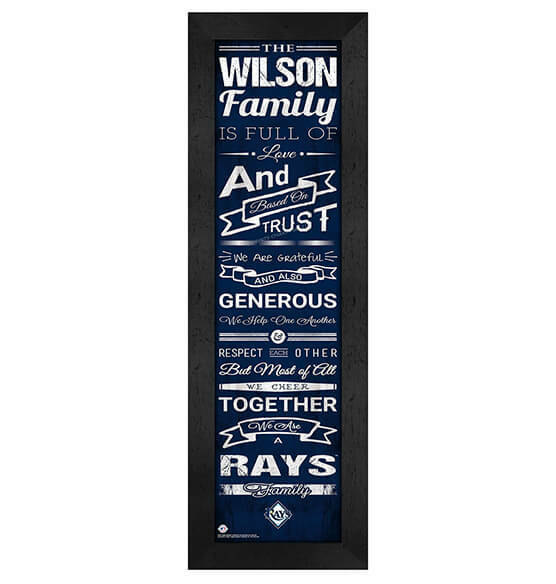 Our sweetly special Family Cheer Tampa Bay Rays Wall Art sports decor has a vintage touch that you'll want to display in your home for years. This vertical-hanging framed print combines your love of the iconic all-American game and your love of family — all within a wall art piece you'll adore. With its vibrant D-Rays team colors and team logo, this high-quality print framed within glass has a powerful message about the strength and unity of your family's team! Great to purchase for yourself or as a thoughtful gift for the die-hard Tampa Bay Rays fan.